Ever since Windows Home Server hit the streets, I've been eying them enviously. I looked at building my own, buying an OEM copy and repurposing a machine I had laying around the house (which was serving the same purpose, albeit all manually), and buying one of the HP models. 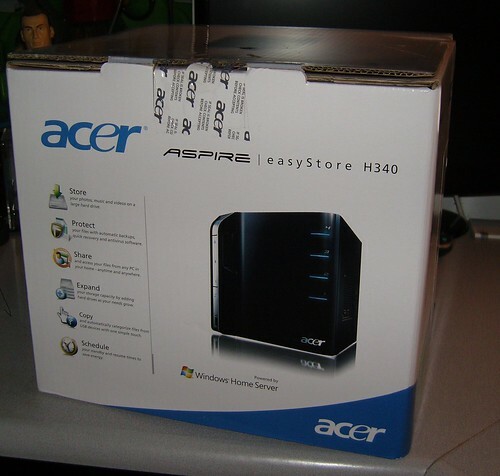 Ultimately, I delayed long enough for another option to be on the table: The Acer Aspire EasyStore Home Server. To me, there's two things I'm looking for in a home server: storage space and expandability. I don't really care about the extras that HP offers - the media capabilities and backing up Macs being the main ones. I'm pretty happy with my home network setup, other than my backup strategy. Don't get me wrong. I had everything backed up - on a nightly basis. I used DeltaCopy on all of my machines, and scheduled it to run nightly. For my machines, I actively ensured that I'd selected accurate folders for backing up important data. For The Wife's laptop, I made sure that I backed up her important folders and told her where to put files to ensure they were backed up. I used Live Mesh to sync important files between machines and "The Cloud". And on a weekly (or so) basis, I used an external drive to do full backups of my main machines. Despite automating a lot of it, it was still a pretty manual process. I had to ensure I was backing up the right things, and if a drive did fail (luckily, it hasn't happened), I'd be stuck reloading the OS and programs manually. Oh, and those weekly backups? Yeah, I might as well call them monthly. Anyway, back to the home server. 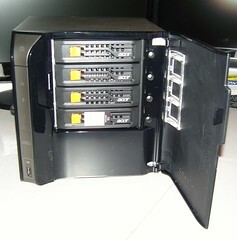 Acer (wisely, in my opinion) decided to keep it simple, and put out a home server without all the bells and whistles. It does what it says it will do (backup your machines reliably and simply), and does it at a great price - $399. So I got one. A few days later, it showed up on my doorstep. For the record, that's a Steve Yzerman bobble head monitoring the unboxing in the upper left. I couldn't resist opening it, and it turns out it's a nice looking machine. All of my pictures of the outside were blurry, but frankly, that works since I'm more interested in the inside. 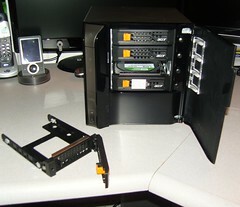 Hot swappable drive bays (another advantage over building my own or repurposing an existing machine) are very nice! Setting up all of my machines to backup was a breeze. With about an hour of work, I had all of my machines set up. I have 5 machines backing up regularly now. The initial backups took a while - I forced a few to start, and each machine took between 2 and 5 hours, depending on how much data and its network connection (the slowest was our older desktop, which has about 100 GB of data and is connected via a wireless connection). Now that they're all backed up, the nightly backups are relatively quick. I set backups to run between midnight and 7:00 AM, and they usually finish before 3:00 AM. One other nice thing is the home server is capable of waking up machines to back them up. I'm able to set my machines to sleep or hibernate after an hour of inactivity, and safely rely on them waking up to get backed up. Before, I had to leave them on at night, so they'd get backed up (or schedule them to be backed up during "busy hours"). So far, I haven't done too much with it, other than using it as a backup server. I have loaded some videos on it, and can watch them on my Xbox 360 (who needs the media capabilities of the HPs anyway!). I installed PlayOn Server on it as well, so I can play Hulu videos on my 360 as well. Getting PlayOn installed is pretty simple, but requires installing Window Media Player 11 on the server first. As I mentioned on Twitter, I've added my WHS box to Live Mesh, which required jumping through a couple of hoops, but nothing too major. And the end result was worth it - I now pull down mesh data into my personal share, which then gets duplicated on there - that means that any data I add to Mesh is in at least 4 places: The machine it was added on, the cloud, and on the home server - twice! About the only other thing I've done is hook it to a UPS. I have the APC Back-UPS ES 550VA, and while it's not huge, the only thing I want is for the server to shut down properly if the power goes out. One note here: do not use the built-in software that comes with the UPS. Everything I read says it can result in data corruption. Luckily, there's Grid Junction, a nice, free add-in that can be used. It's simple to install and it picked up my UPS without issue. I did get an extra drive to go in the server, so I have 2 TB of backup space to work with. With having 5 machines to back up, I honestly wasn't sure how much space I would need. If I look at my disk usage and just add it up, it's about a terabyte of space. After running daily backups for a little over a week, I've used about 400 GB. I'd heard it was pretty smart about how to avoid duplication, and I'm sure there's some compression going on, but that's pretty impressive. Since I have two drive, I also enabled folder duplication for all of my shared folders. There's a chance those shares could be the only place a file is located, so having it backed while on the server is just as important as if it's on my machine, right? I really can't think of anything bad to say about the machine. It works as advertised, it's small, and it's quiet. If you're looking for a solid machine to manage backups, I would highly recommend it.